Russian Talmudist and communal worker; born at Simno, government of Suwalki, Sept. 12, 1797; died at Wilna March 6, 1883. He lost his parents early in life, and at the age of fourteen came to the city of Kovno, where he studied Talmud in the "bet ha-midrash" of the suburb Slobodka. At the age of eighteen he married the daughter of a wealthy relative, and with the financial assistance of that relative continued his Talmudic studies for another six years, when his wife died and he removed to Wilna. There he entered the bet hamidrash of Rabbi Ḥayyim Naḥman Parnes, at the same time studying modern languages and sciences; and he soon acquired a fair knowledge of Russian, German, French, algebra, and astronomy. Like many of the Russo-Jewish scholars of that time, he started a business, a whisky distillery, and with his versatility and energy made quite a success of it. But unfortunately, private distilleries in cities were prohibited by the Russian government by the law of 1845, and as a consequence Barit was financially ruined. When Sir Moses Montefiore visited Wilna in 1846, he spent considerable time in Barit's house, and was guided by his advice as to the form of the petition to Emperor Nicholas I. in behalf of the oppressed Russian Jews. In 1850, when Ḥayyim Parnes established a "yeshibah" (college) for the education of rabbis, Barit was appointed principal ("rosh-yeshibah"), which position he held for twenty-five years, until sickness forced him to resign. About twenty-five learned Talmudic students attended his lectures daily, and many of the eminent Russian rabbis and scholars were graduates of his yeshibah. He was much admired for the logical and shrewd style of his lectures, which differed much from the scholastic and sophistic style of the Polish Talmudists of his time. While he refused to hold the office of a rabbi, he was for many years one of the "dayyanim" (judges) of the Wilna community. But his chief merit, in addition to his work in these two posts, was his valuable services rendered to the Jews of Wilna and to those of all Russia in representing their interests before the Russian government. From 1849, when he was chosen as a delegate by the Jewish community of Wilna, he was always the representative speaker in behalf of that important community. In 1852 he was one of the delegates from Wilna to petition the czar Nicholas I. in regard to the oppressive conscription duties of the Jews by the ukases of Jan. 8, 1852 ("Second Complete Russian Code," xxv., No. 24, 768) and of Aug. 16, 1852 (ib. xxvii., No. 26, 502). Barit was a man of great tact and political wisdom, a pleasant and impressive speaker and conversationalist. 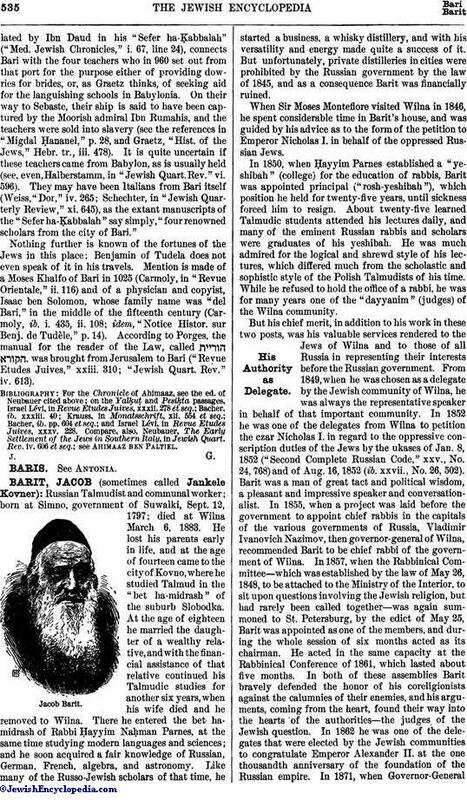 In 1855, when a project was laid before the government to appoint chief rabbis in the capitals of the various governments of Russia, Vladimir Ivanovich Nazimov, then governor-general of Wilna, recommended Barit to be chief rabbi of the government of Wilna. In 1857, when the Rabbinical Committee—which was established by the law of May 26, 1848, to be attached to the Ministry of the Interior, to sit upon questions involving the Jewish religion, but had rarely been called together—was again summoned to St. Petersburg, by the edict of May 25, Barit was appointed as one of the members, and during the whole session of six months acted as its chairman. He acted in the same capacity at the Rabbinical Conference of 1861, which lasted about five months. In both of these assemblies Barit bravely defended the honor of his coreligionists against the calumnies of their enemies, and his arguments, coming from the heart, found their way into the hearts of the authorities—the judges of the Jewish question. In 1862 he was one of the delegates that were elected by the Jewish communities to congratulate Emperor Alexander II. at the one thousandth anniversary of the foundation of the Russian empire. 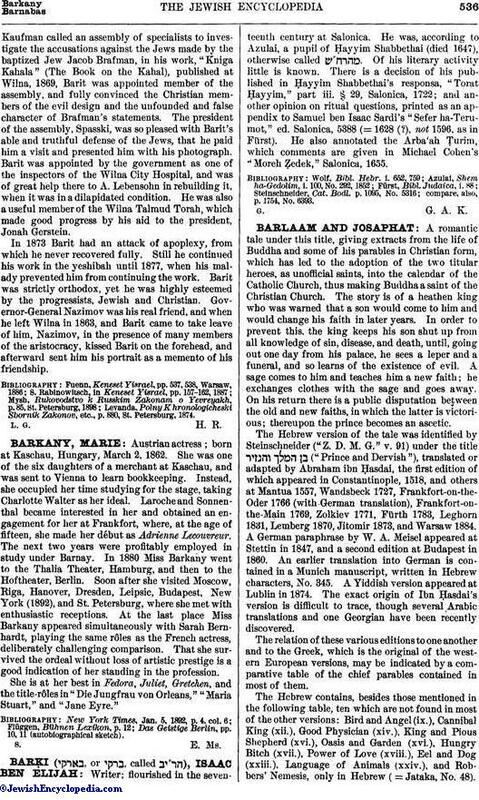 In 1871, when Governor-GeneralKaufman called an assembly of specialists to investigate the accusations against the Jews made by the baptized Jew Jacob Brafman, in his work, "Kniga Kahala" (The Book on the Kahal), published at Wilna, 1869, Barit was appointed member of the assembly, and fully convinced the Christian members of the evil design and the unfounded and false character of Brafman's statements. The president of the assembly, Spasski, was so pleased with Barit's able and truthful defense of the Jews, that he paid him a visit and presented him with his photograph. Barit was appointed by the government as one of the inspectors of the Wilna City Hospital, and was of great help there to A. Lebensohn in rebuilding it, when it was in a dilapidated condition. He was also a useful member of the Wilna Talmud Torah, which made good progress by his aid to the president, Jonah Gerstein. In 1873 Barit had an attack of apoplexy, from which he never recovered fully. Still he continued his work in the yeshibah until 1877, when his malady prevented him from continuing the work. Barit was strictly orthodox, yet he was highly esteemed by the progressists, Jewish and Christian. Governor-General Nazimov was his real friend, and when he left Wilna in 1863, and Barit came to take leave of him, Nazimov, in the presence of many members of the aristocracy, kissed Barit on the forehead, and afterward sent him his portrait as a memento of his friendship. Levanda, Polny Khronologicheski Sbornik Zakonov, etc., p. 880, St. Petersburg, 1874.